My daughter, Elizabeth, has always been fascinated with the hobby. Since she's been old enough to pick up a paint brush she's wanted something little to paint from the game store. Of course she started out just globbing on the paint how she wanted and refused to take any hints. As she's grown and watched me paint, she's developed a pretty steady hand and has begun becoming interested in techniques to help her improve. 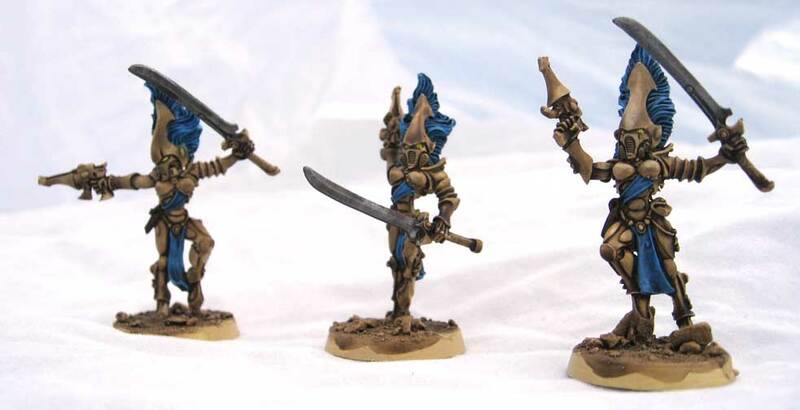 A few years ago she found some articles about the Harlequins from 40K. Immediately she asked if she could get one of the models to try and paint "good." Needing to pick up some stuff from the store anyway, I conceded and let her get a model. I set her up with her own painting station and showed her how to paint. Eventually she decided she wanted her own army and has several boxes of Eldar that we got from various sources. We developed a simple paint scheme that she could easily reproduce and set about painting several squads. Of course being 9 at the time she lost interest and up until recently they sat in a box. Out of the blue she asked about painting again and has discovered the beauty of washes. She's just about finished with that first Harlequin now and asked if I'd post it up on my site.